Nicolas was not always a winemaker. Unlike his cousins, he led his own life away from Bordeaux. After brilliant studies in law and philosophy in Bordeaux, Paris and Switzerland, Nicolas taught philosophy in Rheims for several years. It was not until 1983 that the vineyards at Puygueraud called him back to his native Bordeaux. His first vintage at Puygueraud was a stark lesson in the realities of winemaking. With Peynaud’s book on winemaking in one hand and secateurs in the other, he started his first vintage. Château Puygueraud was purchased by his parents – George Thienpont (spelt without an “S” to distinguish him from his father) and his Flemish mother, Monique at the end of the 1940s. It is a gorgeous 14th century château with an ancient tower and commanding views over the Côtes de Francs. The estate covered 70 acres of pastures and woods, perfect for starting an agricultural business. The 6 hectares of vines that existed were in a state of abandon and George decided to dig them up. George had a law degree and specialised in animal husbandry and maize cultivation. He introduced a rare breed “the blond d’Aquitaine” to the estate – they are still found at Puygueraud today where Nicolas’ brother, Matthieu, oversees the farming business. At first the main crop at Puygueraud was apples and kiwis. However in 1967 a new “appellation controlée” was created for the region – Bordeaux Côtes de Francs. It was to be another ten years before the area began slowly to wake up and George planted his first vines in 1979. Nicolas’ first vintage in 1983 was an immediate success. George Thienpont was the first winemaker to recognise the potential found in the outlying hills of the Saint Emilion area. Today the Côtes appellations are prized for their beauty, authentic, rich, spicy wines and their good value for money. Thirty two acres are planted at Puygueraud on loam and clay-limestone soils with a blend of 55% Merlot, 25% Cabernet Franc, 15% Cabernet Sauvignon and 5% Malbec. A second wine, Clos de Bories was introduced to separate the various qualities of the estate. Nicolas soon felt the urge to seek other winemaking challenges – a passion that has driven him throughout his winemaking career – and especially to find new vineyards in the Côtes de Francs which he felt was underrated as a wine appellation. In 1984, Nicolas purchased 7.5 hectares of vineyard from Château Puygueraud and created Château Laclaverie, named after the 15th century towers found in the vineyard. The soil is sand on a bed of clay-limestone and the vineyard is composed of 50% Merlot and 25% each of Cabernet Sauvignon and Cabernet Franc. In 1988 Nicolas seized the opportunity of buying another neighbouring estate, Château Charmes Godard whose various parcels were planted with both red and white grapes on a limestone/clay mixture with some loam on a marly subsoil. The red vines are 70% Merlot and 30% Cabernet Franc while the tiny 1.5 hectare parcel of white grapes is a blend of 65% Semillon, 20% Sauvignon Gris and 15% Muscadelle. This was followed two years later by the purchase of Château La Prade, also located on the limestone plateau of St. Cibard. This 7 hectare property planted with 85% Merlot and 15% Cabernet Franc produces rich, juicy wines with good freshness. The last purchase by Nicolas was Chateau Alcée in the Côtes de Castillon. With a varying palette of wines to produce, Nicolas adapts his winemaking to each terroir. Since the Côtes de Francs is a late-ripening area, Nicolas is found juggling the different stages of maturity at harvest, long after his cousins have finished picking. It takes a cool head and an intimate knowledge of his vines. The wines are harvested, hand selected and gently pressed before being fermented in either stainless steel or concrete vats. He is known for his moderate fermentation temperatures and long, gentle macerations in order to extract fruit and not excess tannins out of his wines. Each wine is aged in a mixture if new and older French oak barrels for between 18 to 20 months before being fined but not filtered. Nicolas’ red wines from the Côtes de Franc share a frank expression, a rich, earthy character mixed with scents of plums, cedars, liquorice and pepper. While the have expressive aromas, their texture and body are surprisingly supple. 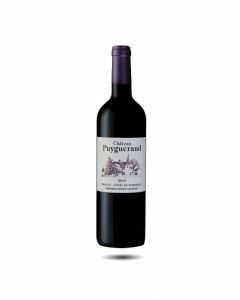 Puygueraud is prized for its rich and spicy flavours and is the most full-bodied for the wines. La Prade more overtly fruity with a mixture of berry aromas blending well with the oak. The Charmes Godard red is quite structured and austere when young. The Charmes Godard Blanc gives Nicolas a chance to vinify a complex white wine. Picked by hand, carefully sorted and de-stemmed, the juice is allowed to settle at cold temperatures before being transferred to oak barrels. The fermentation can take as long as eight months during which time the wine is left on its lees which are stirred up using the old system of “bâtonage”. The result is a very complex, rich wine that nevertheless has a backbone of freshness and very expressive aromas of white flowers, peaches and cream. In 1995 a new challenge was presented to Nicolas when he was asked to take over the wonderful estate of Château Pavie-Macquin, a grand cru classé Saint Emilion, beautifully located on the top of the appellation’s famed limestone plateau. Since 1986, the estate had been run by Madame Barre according to bio-dynamic principles. At that time this method of organic farming was new to Bordeaux and the estate suffered several disastrous harvests. Upon her retirement, Nicolas was delighted to have an opportunity to discover more about this method of organic culture and adapt a more pragmatic approach. The Château already had an illustrious history in viticulture. It had been purchased in 1897 by Albert Macquin an agronomic engineer who had successfully developed the revolutionary grafting technique that saved the Bordeaux vineyards after the phylloxera crisis. Nicolas found a young vineyard worker called Stéphane Derenoncourt (now famous for the wines he producers throughout Bordeaux) and together they brought the vineyard back to more classical organic farming methods. Respecting above all the 14.5 hectares of old vines (a significant part are over 60 years old), the vines were pruned on a double cane to open up the canopies, the rows were ploughed and re-sown with organic cover crops and a programme of organic spraying was introduced. Green harvests, leaf stripping and low yields all contribute to ripening pure, ripe grapes. The vineyard is planted with a mixture of 70% Merlot, 25% Cabernet Franc and 5% Cabernet Sauvignon vines. At harvest time, the grapes are hand picked and twice sorted before being transferred to cement vats – each charmingly given old-fashioned girl’s names such as Aglade, Berthe, Fernande and Gertrude – where they undergo a long maceration often lasting one month. The wines are aged in barrels (70% new French oak) for approximately 16 months before being gently filtered but not fined before bottling. Total production amounts to about 7000 cases including a second label “Les Chênes de Macquin”. Pavie Macquin is rich and vibrant with very clear, red and black fruit flavours and an intense fresh structure that mixes fruit, tannins and oak in a harmonious, silky, whole. Nicolas’ work at Pavie Macquin was rewarded when the Chateau was upgraded to a Premier Grand Cru Classé in the 2012 classification of Saint Emilion. Nicolas, ably assisted by his winemaking son, Cyrille, who is also managing L’If for his uncle Jacques, is today also overseeing the wine at Chateau Berliquet, Chateau Beauséjour Duffau-Lagarrosse and Chateau Larcis Ducasse which, after ten years of Nicolas’ management, was promoted, like Chateau Pavie Macquin, to Premier Grand Cru Classé in the 2012 Saint Emilion classification. Nicolas is truly the “thinker” of the family with a hundred and one projects turning in his head. He has a quick, lively intelligence and is as likely to quote to you in Latin as to relate the latest joke picked up in the local wine bistro. He is keen to share his new techniques and ideas with his cousins or anyone else who is interested and has become known as one of Bordeaux’s best and most exciting winemakers. Nicolas’ rare moments of relaxation at the Arcachon Basin allow him to ponder on his achievements and think about the challenges ahead.